Cannabis humidors Canada. At Cigar Star we know humidors! Two decades manufacturing unique handcrafted works of art to keep cigars fresh for years. Therefore, with our expert knowledge that we have gained in tobacco aging perfectly inside any of our humidors for years. Cigar Star now offers luxury cannabis humidors Canada at affordable prices! Because, many retail cannabis shops are opening up throughout Canada, we now offer some pretty unique options to store your cannabis safely and inside the proper environment. Our Cannabis humidors Canada are made using only the highest quality materials on the market. Most importantly we use kiln dried Spanish cedar or mahogany inside our humidors. First of all, both of these woods offer moisture retention, this allows your cannabis to stay fresher longer. Why is this important? First of all, weed that is bone dry can turn to dust when attempting to roll it into a joint. It can also cause weed to loose potency over time, if not well stored. Now that cannabis is legal in Canada, why not store your flowers properly & responsibly? Our cannabis humidors provide both. Most importantly, keeping your cannabis under lock and key keep children form accessing your stash. Besides that, with our humidors you also get the global leader in two-way humidity Boveda ensuring the proper humidity inside to maintain freshness of your flowers, when your ready to indulge. Some may say that it does’t matter how you store your cannabis. You can store it in a glass jar to retain the freshness. Although if you have children this is not the safest way to store your cannabis. Pictured above is our Deniro 4 strain cannabis humidor / weed humidor. Rich coloring, great design are graceful and well blended. 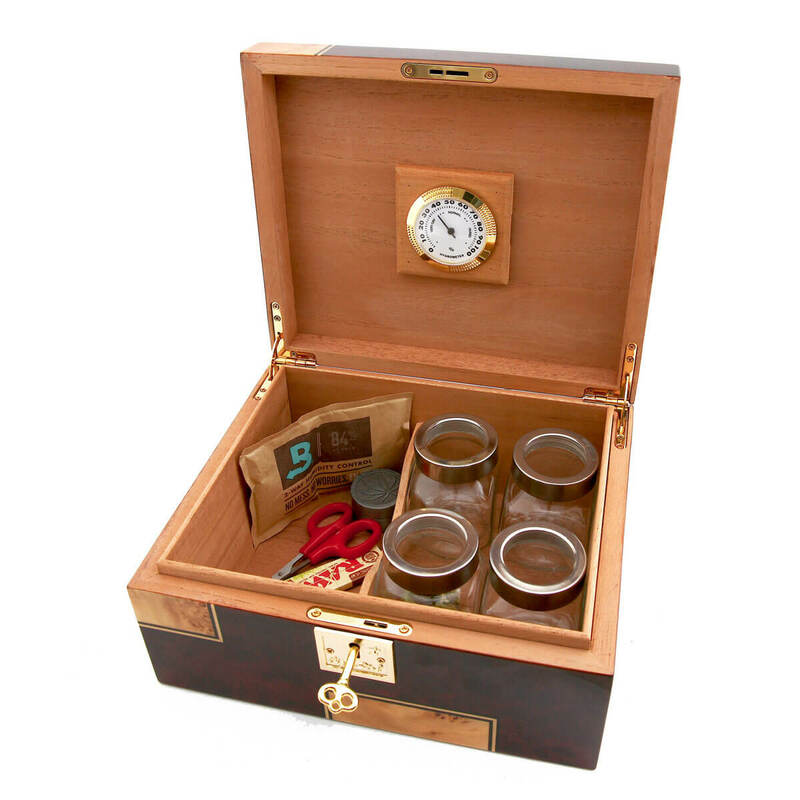 Finally, hand crafted from selected solid woods makes this a perfect choice for those looking for a handsome and unique cannabis humidor. Fine wood grains are absolutely fantastic. 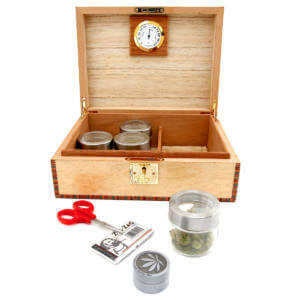 This humidor is the perfect choice for any cannabis lover. Weed humidor with style and flare! Check out our line up here. They make the perfect home for your stash. Also they an amazing gift.